Jordan and Bailey have known one another since high school, but finally reconnected at church last year and started dating right away. Last week was their year anniversary of dating, and Jordan popped the question 💍Bailey goes to school in Gainesville, FL and Jordan goes to school in Knoxville, TN (my alma mater- woot!) so you can imagine how excited they are to get married and finally be together. 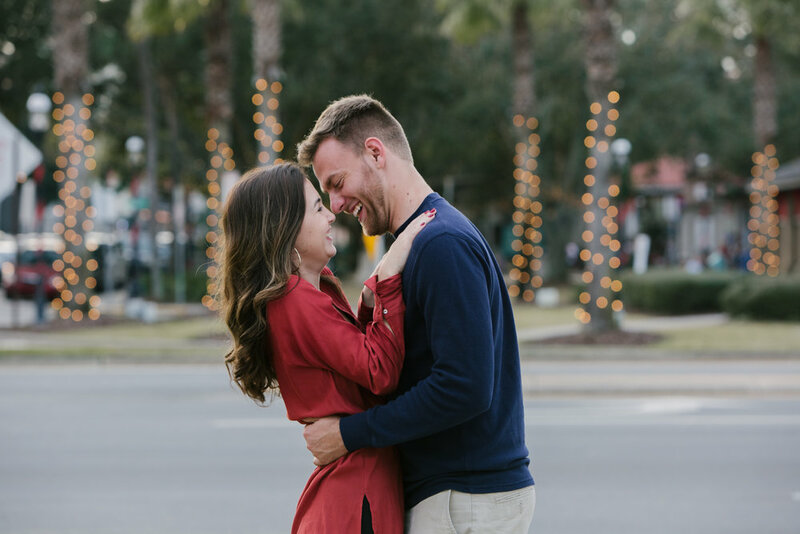 We met in downtown St Augustine for their engagement session, and it was perfect! There were lots of tourists walking around…but who can blame them?! The Christmas lights are all still up on the palm trees and it looks so magical 🌴The three of us took our time walking around the area (they were so patient with their pregnant photographer 😜), and it was a blast! I’m so thankful that you contacted me to capture this special time in your lives! You two were a blast to work with and I’m so excited for this next stage in your relationship. Thank you for making our session fun and not walking too fast 😂👌🏻Good luck with your school semester and wedding planning! 2018 was a whirlwind of a year! It was such a crazy few months for Eli and I as we moved to a different state, and even found out that we are expecting our sweet baby. Both of those changes marked huge milestones of changes for Mathers Photography, but I’m so excited to find out a new norm in 2019 ✨ I’m vowing to find a better balance with less screen time and more relationships. I want to thank each and every person who supports MP… because it wouldn’t be the same without you! The Lord has blessed this business more than I could have ever imagined, and I’m so so thankful. 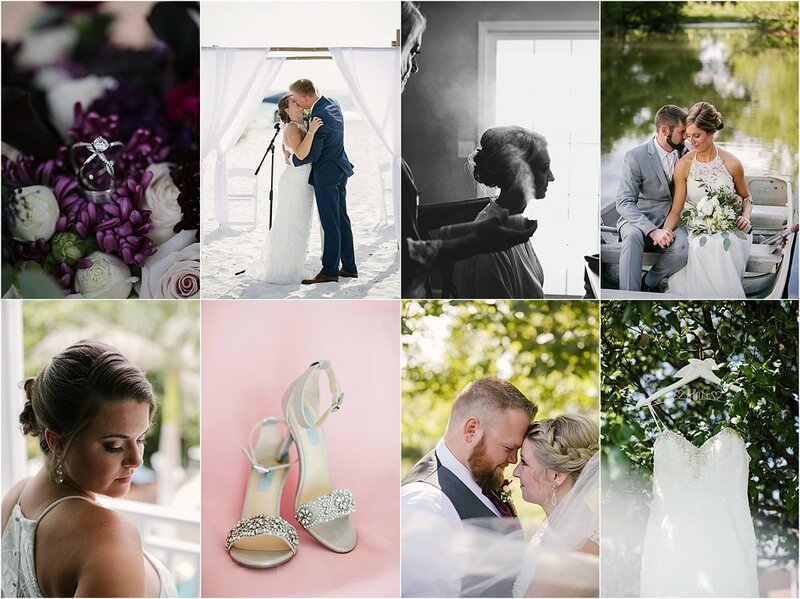 When I think back to every one of these beautiful weddings..I can’t help but feel so honored to be apart of so many special moments with so many wonderful people 💕 Whether it is taking photos of the first kiss, helping fluff out a dress, witnessing first look tears, planning out a timeline for the day, or even giving grandma a helping hand…It’s such an amazing feeling to have couples who trust me to capture one of the biggest days in their lives! Joe and Mo hired me for an intimate St Patty’s day wedding ☘️ I loved how laid back and fun they were. Mo had the most adorable green shoes..and I died over that dress. They embraced the cold and rainy weather with smiles on their face. Such a fun day! Luke and Autumn’s day in Evansville was beautiful ❤️I remember walking around downtown Newburgh to find some photo spots..and we found THE perfect area for bridal party photos. We turned the corner and found a gorgeous bridge area that was completely covered with trees…Aka lots of beautiful shade! Some details I didn’t notice until after the fact: Autumn is a cosmetologist and we ended up with some of my favorite getting ready photos. Also, I ended up posing the brides maids (on accident) in a way that their hair looks like “ombre” 🙈😂 Such a sweet coincidence! Jacob and Kyra’s day was filled with so much joy ✨You can see it not only in the smiles on their faces, but also in the bubbly pink details they decorated with. I was absolutely in AWE of how beautiful Kyra’s bouquet was! I probably spent a whole thirty minutes shooting details with it 😍Another moment that sticks out to me from that day is the mother + son dance during the reception. Just check out the photo below..it’ll melt your heart! Cierra and Hank’s big day was near and dear to my heart! I’m good friends with these two love birds..and it was an honor to go to Anna Maria Island, Florida and capture their wedding day ❤️I love how well they handled the Florida summer heat and that you can’t even tell it on their faces! We went down to the water in the middle of the day and got some of my favorite shots. Hank and Cierra were so sweet and comfortable with one another, that it made my job super easy to pose them. I wish we could relive this day! Jacob and Rebekah had the infamous Royal wedding 👑There was something about Rebekah’s princess dress, the spot we had their first look, and how their reception was decorated that made me feel like the king and queen were getting married. My favorite moments with these two are when we escaped from the reception for some newly wed portraits. I loved how Jacob and Rebekah “let loose” and modeled for the camera! Sophie and Zach had a gorgeous summer wedding at Abram Farm in Indiana ☀️This couple was such a joy to work with- I truly connected so much with Sophie that it felt like we had been friends for a long time! I think you’ll be just as obsessed with the details from this day like I was. Sophie did such a great job with planning all of those sentimental details out..she is an event planner and you could totally tell. Everything from her colors, to her getting ready pajamas; to the glasses they had mimosas in for toasting. Her perfume bottle even coordinated with her colors. I was seriously giddy when I was taking all the detail photos! This session was one that was so special to me 💕Do you remember the sunrise session I had with Sara and Sophia earlier this year?! It’s crazy to think about how much has changed in these short six months for the both of us. Sara and I have been good friends, and I was so sad to leave her this year when we moved down to Florida! Last week I randomly got a text from Sara saying that her, her boyfriend Michael (Sophia’s daddy), and Sophia would all be down in Florida for the next couple of weeks. She said that they would be staying about 3 hours away from where I live, but were willing to drive up to visit me and book a family session 😍Of course five minutes later we had our shoot all planned out and my heart was leaping for joy! When we met up for our shoot last Sunday, we decided to go to Anastasia State Park for the evening. I loved having Michael join us for this session, because it added such a sweet dynamic. You could tell Sophia loved having her mommy and daddy with her at the beach. There were a few instances that I was trying to take pictures of Sara and Michael together, but Sophia would run into the frame to be in there with them 😭My heart melted! I think my favorite part of this session was watching a three year old from Indiana get to run and play on the beach…you could tell she was filled with so much happiness. Sophia wrote in the sand, chased the birds, and even played in the water. At the end of the shoot her dress was all soaked and sandy 🌊I think that is a sign of a successful night at the beach! Thank you SO much for spending six hours in the car just to see me and book a family session 😘Our night on the beach was a blast…taking photos and getting some time to catch up! I love your sweet family and can’t wait for more photo sessions together in the future!